Capture smooth mobile video with the compact, flexible Moza Mini-S Essential Smartphone Gimbal. This white three-axis gimbal folds to just 7.7" in length, suiting it for both travel and everyday use. The Mini-S Essential supports smartphones weighing up to 9.9 oz and measuring 2.28 to 3.46" in width. A 10° tilt in the Mini-S handle design provides a unique, comfortable gripping position. Enhance your footage with Hyperlapse, Slow Motion, Sport Gear, Vertigo, Inception, and additional shooting modes. The gimbal's lithium-ion battery provides a maximum runtime of approximately eight hours. The three-axis Mini-S gimbal offers 270° of pan, 200° of tilt, and 315° of roll, as well as focus control, one-button zoom, and quick playback control. Flip the Mini-S into its vertical Portrait mode for live streaming or selfies. Connect the Mini-S Essential to the downloadable Moza Genie smartphone app for creative touchscreen camera control. 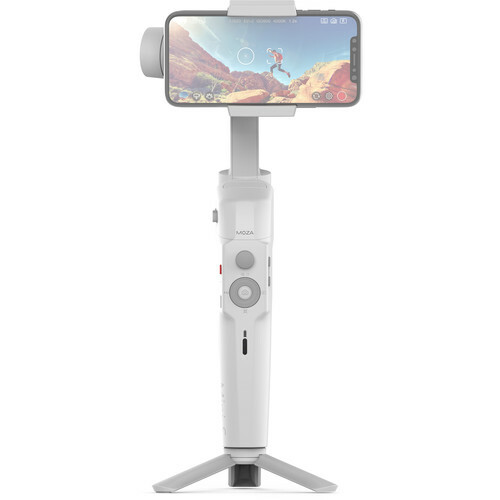 A micro-USB cable, camera control cable, mini tripod, and carrying bag are included with the Mini-S Essential Smartphone Gimbal.